Twitter is a unique platform that has taken the world by storm. The beauty of the application lies in its simplicity. It does not discriminate between people unlike other social networking sites. Over here, anyone can follow anyone. Be it a politician, film star, musician, writer, anchor, ceo, brand, etc or a friend. Everyone is here, and if they are not here, they will eventually reach here. Have no doubts about it. At the very beginning of my tryst with twitter i realized that one can become superman just by being on twitter. A blog post that i wrote at the start of this year called "You can be Superman : Use Twitter" speaks in detail about the power and relevance of twitter in today's times. Since then, having spent a few very active months on twitter, my belief that twitter can change the world has been reinforced manifold. Just speaking from the Indian perspective we have witnessed quite a few events in a very short span of time with regards to twitter in public glare. It has been used as both a weapon as well as a balm at various times. It has the ability to be the most valuable tool in the hands of the right person and at the same time can be the most explosive and dangerous tool in the hands of the wrong person. We have witnessed how a Shahrukh Khan managed to settle a volatile situation with a simple tweet. We have also seen the fracas over the IPL franchises, courtesy few tweets from Lalit Modi & Shashi Tharoor. Its just the start of the Indian twitter journey and we already have enough dope to fill volumes and countless hours of television footage. Everyday there is so much chatter among the twitterati (celebrity who are on twitter) that news channels and journalists are rethinking their strategies as their role as the voice of a celebrity is almost dead. Not everything on twitter is serious though, the amount of fun people have here is unbelievable, some of the funniest quotes and jokes originate here, it is a fantastic place to have fun without any doubt. 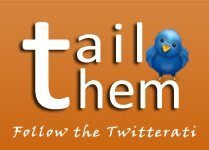 At 'Tail Them' we follow (tail) the most interesting conversations among the twitterati (them) and bring those stories to you with additional context to the happenings which twitter would never be able to give you. We start tailing our twitterati from today and hope to bring to you the best stories on twitter. We also request you to send us leads to interesting conversations on Twitter so that we can get on to it in quick time. Please subscribe to our Newsletter to get latest updates by email and do join our page on Facebook and follow us on Twitter to have conversations with us. Hope you would support us in this endeavor and make this a fun and informative site that captures the pulse of the world with unbiased and honest representation of happenings.